High energy costs and a slowed economy have forced many businesses to downsize to cut expenses. One of the hardest hit areas for businesses is travel. 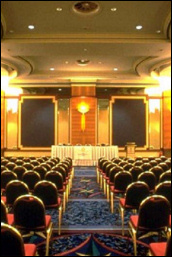 Often travel is required for conferences, training and client meetings or visits to satellite offices. Many companies can no longer afford extensive travel but still must meet these travel obligations to remain competitive. Video conferencing is a viable solution that has resolved this issue for many companies. Video conferencing technology has given company employees and managers the power to meet their travel obligations without ever leaving their office. Video conferencing, or web conferencing as it's also known, is a means by which a company can provide a real time virtual presence in one or many locations. This presence is accomplished using live audio and video, allowing each participant to be seen and heard. The scalability of modern video conferencing technology makes it a good choice for almost any business environment whether it's for inter-office meetings or global operations. Video conferencing platforms vary from simple to complex, with the simplest form being software installed on your company server or being hosted by the provider. A more complex solution may include dedicated proprietary equipment and telephone lines. Although large companies may still use dedicated equipment and lines most modern video conferencing is IP (Internet Protocol) based. Modern IP-based video conferencing provides features such as audio using voice over IP (VoIP), video, desktop presentation and file sharing. These capabilities can ensure a more productive meeting. A standard PC with a web browser, a high-speed Internet connection, web camera, and microphone is usually all that is needed. Attendees join the meeting by clicking on an invite link that normally arrives by email or instant message. Some leading web conferencing products are Adobe Connect, Citrix GoToMeeting and Cisco's WebEx Meeting Center. They each offer the basics of video, audio, presentation, file and whiteboard sharing. Connect Pro users can use a free synchronized telephone service or VoIP. The software can also be licensed and installed on your company server. They also offer a hosted solution which provides 128-bit, end-to-end encryption and is DCTS JTIC certified. GoToMeeting is very easy to use - just register and set up an account online and you're ready to host and attend meetings. There's practically no training required. Meetings can be recorded for later playback, as with the other products. GoToMeeting also offers the telephone or VoIP option but there are long distance charges for the telephone service. Cisco's WebEx is the leading on-line meeting solution. The company provides hosted and hardware solutions only. WebEx Meeting Center's refined interfaces and user interactivity levels do a great job of emulating a face-to-face real time meeting. WebEx can easily support global meetings with hundreds of participants from around the world. As can be seen, platforms range from proprietary systems to software and hosted solutions. One should exercise due diligence in selecting a solution that is compatible with your company's budget, bandwidth capabilities and growth potential. Reduction of travel to and from remote offices. Today's smart business can get the benefits of in-person travel and globalization by taking advantage of web and video conferencing. The latest generation IP-based software and online services are flexible and less expensive, ensuring you will find a solution that is right for your business. This technology will level the playing field between you and your competitors no matter how big they are.